This year the Global Classroom creative writing competition took place. This year, almost 4,500 young authors and artists from 28 schools and two Sanlitun students were chosen for the anthology. Two Sanlitun students have been published in the Global Classroom book 'Somewhere Unforgettable'. Chloe Huang from year 4 wrote 'Emeya, the Mountain of Many Secrets' and Saffron Goggins from Year 5 illustrated 'The Sapphire Beach'. 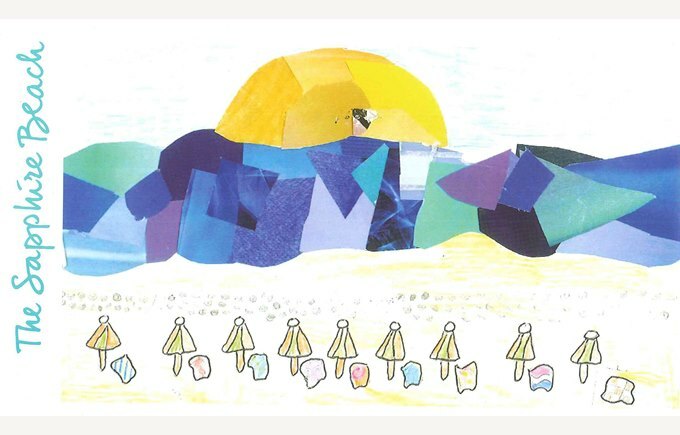 In just 500 words or one illustration, primary and secondary students were challenged to excite and inspire readers with the theme of an ‘unforgettable place’. The place could be real or imagined, somewhere they’d been or somewhere they’d like to go. The judges were blown away by the clever and careful use of language to paint a picture, evoke emotion and bring to life unforgettable places. They found it a real challenge to choose the just ten stories from each age group, so being selected for inclusion is a considerable achievement. We also invited young artists to submit entries for the illustration competition under the same theme. We received 450 entries and judging this competition was also difficult due to the high standards. The 15 illustrations published in the anthology will take you from the Golden Gate Bridge in San Francisco to a sunset in Africa, and from the top of a cliff to the depths of the ocean.